What is the purpose of education? What kind of people do we want our children to grow up to be? How can we design schools so that students will acquire the skills they’ll need to live fulfilled and productive lives? These are just a few of the questions that renowned educator Dennis Littky explores in The Big Picture: Education Is Everyone’s Business. The schools Littky has created and led over the past 35 years are models for reformers everywhere: small, public schools where the curriculum is rich and meaningful, expectations are high, student progress is measured against real-world standards, and families and communities are actively engaged in the educational process. For college admissions officers who want diverse applicants with real-world learning experiences. For students who want to take control over their learning … and want a school that is interesting, safe, respectful, and fun. Here, you’ll find a moving account of just what is possible in education, with many of the examples drawn from the Metropolitan Regional Career and Technical Center (“The Met”) in Providence, Rhode Island—a diverse public high school with the highest rates of attendance and college acceptance in the state. The Met exemplifies personalized learning, one student at a time. 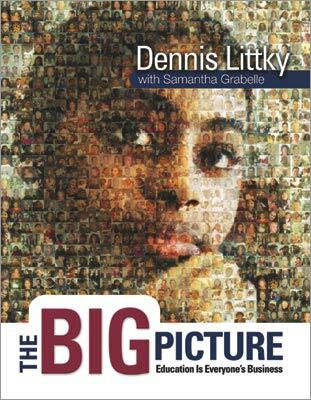 The Big Picture is a book to reenergize educators, inspire teachers in training, and start a new conversation about kids and schools, what we want for both, and how to make it happen. "In these pages you will find an account of a remarkable, unconventional education reform movement, and the philosophy of a charismatic and tough-minded progressive. Dennis Littky is American education's most persuasive provocateur, pushing ideas that are exactly what is needed in these troubled times." "In the face of new competitive threats, America will thrive economically only if our education system takes a 180-degree turn. Sometimes I think only Dennis Littky knows exactly what needs to be done. He shares it in this book." DENNIS LITTKY is director and cofounder of the Metropolitan Regional Career and Technical Center (“The Met”), in Providence, R.I., and codirector and cofounder of The Big Picture Company, a nonprofit education reform organization that creates and supports small, personalized, public high schools that work in tandem with their communities. SAMANTHA GRABELLE is Dennis Littky's assistant at The Big Picture Company and The Met. She earned a B.A. with honors in multicultural education from Brown University and a master's degree in social work with a concentration in community organizing from the University of Connecticut School of Social Work, where she was named the Connecticut National Association of Social Workers' Social Work Student of the Year.